Five Palestinians sustained moderate to serious injuries Thursday evening when the taxi they were travelling in was hit by a Molotov cocktail and caught fire. The vehicle was struck as it was travelling between the West Bank settlements of Bat Ayin and Gvaot, in the Gush Etzion region, and overturned. The injured Palestinians were evacuated to Jerusalem's Hadassah Ein Kerem Hospital for treatment. Arab League to present UN with new PA bid? A police official said the attack was carried out by Jews and was nationalistically-motivated. IDF forces were scouring the area in search of the assailants, whose identity remains unclear. During the search, another firebomb was found, but it was not lit. Most of the wounded Palestinians are members of the same family from the Nahalin village, near Bethlehem. Red Cross officials in Bethlehem identified the injured Palestinians as a 35-year-old man, his wife, 27, and their children, aged four and five. The driver was also hurt. The parents are suffering from second and third-degree burns, while the children are suffering from first-degree burns, the Red Cross said. Osama Shakarneh, head of the Nahalin council, told Ynet that village residents travelling to Bethlehem along the same road are frequently attacked with stones. 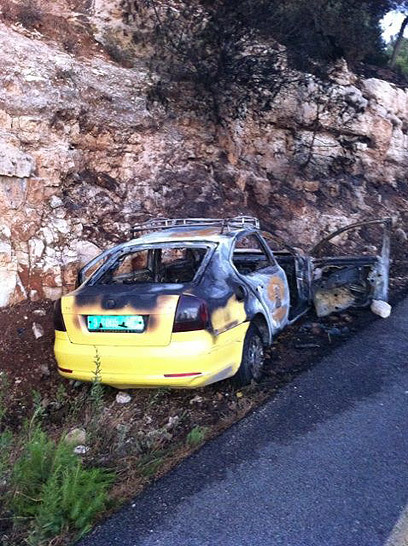 See all talkbacks "Firebomb injures 5 Palestinians; police say Jews behind attack"